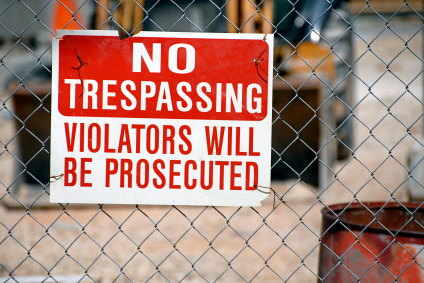 Trespassing is the crime of unlawfully entering another person’s property without permission or authority. Interfering with an owner or legal tenant’s use of their property, such as enclosing a portion of another’s land, also constitutes trespass. Trespass is usually a criminal misdemeanor, and is also a crime from which a victim may recover monetary damages. A person commits the crime of trespass in the first degree if he knowingly enters unlawfully or knowingly remains unlawfully in a building or inhabitable structure or upon real property. The nature of the property determines the seriousness of the offense. For example, trespassing at a school is a more serious offense than trespassing in a rural field. Trespassing may seem like a relatively minor criminal charge, but there can be unfortunate life consequences for anyone who ends up with a permanent criminal record. A criminal conviction shows up on a background check, and can limit your ability to get many different kinds of jobs. If you are accused of trespassing you should speak to a lawyer immediately to learn more about your rights, your defenses, and the complicated legal system. We will help you fight these charges, and give you every opportunity to get the charges dismissed, or beat them at trial. Call The Sheena Law Firm today for a consultation.